This game is an awesome buggy mess. Today almost every chest and bag I opened was empty. There is a 24 hr timer on all chests that can be looted more than once. Sometimes the chest still acts like it can be re-opened. Massive is aware of this and working on it. Sounds like we may get visible timers. That would be helpful. I was doing a main mission over opening luggage, gun cases, bags, chests, etc. Originally I followed this guide since I saw people with this gun but no in game direction for how to get it. It was the first hit on Google so I just went with it. I did the missions in that order. Thanks for the link. I know there are lots of guides out there but I used your link since you posted it here. For anyone doing this, you don’t have to run Bank Headquarters on Challenging difficulty. I breezed through it on Normal difficulty for the blueprint. Also I had a really lucky run and got each chatterbox part on the first Hyena crate I opened. Last night I stumbled onto so gates I previously opened, and they awere still open,but the padlocks were back, sometimes floating mid air. Still not been able to complete that one mission wehre I got a DC, tried to get where I was by blowing myself up but no dice, going to need to contact someone to get that sorted I fear. That's called me being an idiot and drawing fire as a moving meat shield. The AI does tend to go for an open target almost to a fault and it's risky but it can work if it comes together just right. Currently about 473 GS but may up the difficulty on a few missions to see if i can get some higher GS quality stuff. (Probably die a lot, but you can only learn while doing..lol) Have noticed that wandering groups tend to be a lot more aggressive at WT5 and usually contain more purples and elites. Been getting some with all elites on occasion. As for crafting, i thought i was stuck at 250 GS with it but dumb me didn't see the printer filament requirement at the bottom that i needed to upgrade it. Now that i know to watch for it should go quicker i think. Still having fun for the most part. 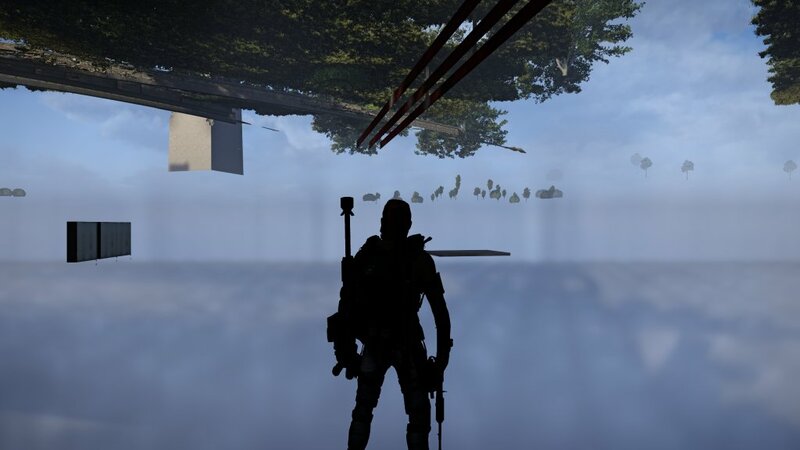 So this is what you can run into when opening random doors while underground, anyone else seen some of these? CrimsonKnight13, Q-BZ and Frraksurred like this. As for crafting, i thought i was stuck at 250 GS with it but dumb me didn't see the printer filament requirement at the bottom that i needed to upgrade it. The only way I know to get these is by deconstructing Gear & Skill mods. Yeah, I've run into that a few times but it's pretty rare. I don't think I saw this under DX11, only DX12. Been running DX12 since upgrading my MB/CPU/RAM and it's been pretty stable otherwise, no crashes. This is both disappointing and encouraging. I'm only disappointed because I have to wait longer, but I think it is the right decision. With the PTS starting today, it will give them time to listen and iterate. Long term, it is a good move that will improve the over-all game. The Division 1 PTS saved the game, and possibly the franchise. TBH there is no usefulness to the bench except for mods. The crafted weapons can't even be recal'ed so those are pretty useless. Well maybe for stealing stats off of them. Forcing us into the DZ for 515 gear is stupid.At least add it to heroic missions. I am not looking forward to getting ganked in the DZ. 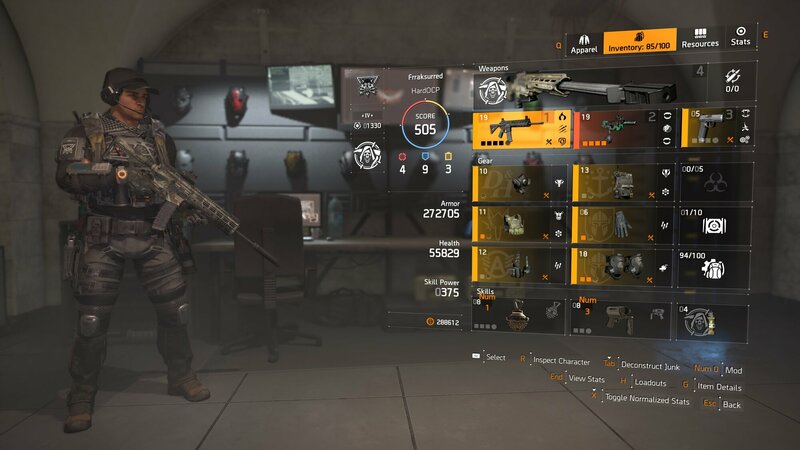 What's this about 515 gear in the DZ? I use the recal station to make 515 gear. Also, you can run around in the DZ and totally avoid any rogues pretty easily. I'm totally not into PvP in this game so I hardly ever see any. This is changing, he's referring to the changes talked about in the SotG. 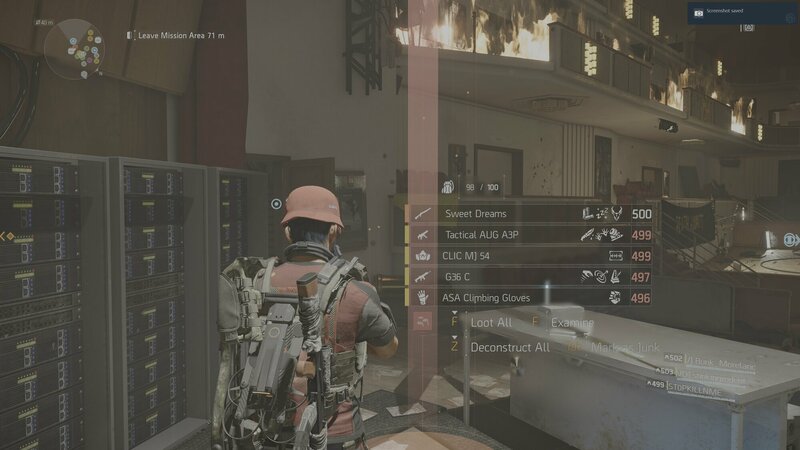 DZ's will be more populated, have less clean gear and more contaminated gear, be normalized to GS500 with multipliers specifically added to keep PvP and PvE separated. Have gone into the DZ a few times but not really much into PvP nowadays. (Have had a lot of bad experiences with it in other games) DID do my first challenge mission though. Wasn't too bad till i got to the end, where i had to destroy 3 EMP devices in 3 minutes. Died like 7-8X on that section till i was able to figure out a strategy that worked for me. Frraksurred and criccio like this. Have gone into the DZ a few times but not really much into PvP really. (Have had a lot of bad experiences with it in other games) DID do my first challenge mission though. Wasn't too bad till i got to the end, where i had to destroy 3 EMP devices in 3 minutes. Died like 7-8X on that section till i was able to figure out a strategy that worked for me. I see a lot of complaining online after the SotG, and I think many of those people are missing the point. Massive and Red Storm are listening and trying to improve the game based on our feedback. This includes both PvE and PvP players. They've released a PTS not even 2 months after the game's release, that is a huge deal! That is more the point than "omg they nerfed "Clutched" yadda, yadda, yadda. There will be a boatload of nerfs and buffs, that is what a PTS is intended to test. They are going to experiment with a ton of things and see how it plays out. Now is our time to give constructive feedback. Jumping to conclusions and complaining at this point is short-sighted and will only serve to clog up the lines of communication. There are already things I am excited to hear, and things that tick me off; but I went through this with D1 and recognize what they are attempting to do. This is all a good thing, and so long as it produces good conversation between us and the Devs, the game will benefit from it in the long run. We are going to have to give it time to get there however. A lot of the complaining is coming from the PvE'ers who feel PvP has no place in this game... and I disagree. I am primarily a PvE'er, and when PvP balancing would screw things up for the PvE players in D1, it made all of us mad. Some of the changes from D1 to D2 seem to be aimed at addressing that; they do seem to want to balance PvP and PvE separately, which is something I want to support. Still some nerfs and buffs are going to affect both parties; I don't see how they can avoid this. The bulk of Division players are PvE focued, but the PvP crowd is no less important. The game has advertised PvPvE from its conception. They are only here for what they were told would be here. They paid for the game too, and have a right to that content. I have never felt PvPvE would ever create anything other than a rabidly 'hate towards one another' player base, but that is besides the point. It's here and it's not leaving, so in my opinion we should just get down to how it is going to work best so both parties at least live with it. And that is the end of my rant on the topic, lol. Only time will tell how this plays out, I just think it will go faster and smoother if more people choose to be constructive instead of destructive. jmaker, CPCEleet, Skott and 2 others like this. I hope they don't make some loot only available via PvP. I stopped playing other games when that happened. Not liking the direction the game is going if some of these changes are implemented. Gear is becoming single focused due to attribute requirement increases and being obsolete every few weeks due to the nerfs. They basically want us to use their crappy sets they made while nerfing everything else that made the game fun. Don't think I'll be playing the game as much or at all, no point to optimize when everything is being changed or nerfed into the ground. The defense requirements for the heal talents are going to go up, some a lot. DZ loot mechanics changed a lot for the annoying. boss drops will always be contaminated as will a lot of the loot now. you used to be able to ignore contaminated gear vs getting oneshot on extraction. Now it will be the only place for 515 gear and they have said the difference will be noticeable. But wait you say, you can recalibrate to get 515. BS. You need to get gear that has the exact talents you need along with the exact stat types you need. then you can recalibrate a stat to get 515. good luck getting all that stuff right. A lot of the complaining is coming from the PvE'ers who feel PvP has no place in this game... and I disagree. I am primarily a PvE'er, and when PvP balancing would screw things up for the PvE players in D1, it made all of us mad. Some of the changes from D1 to D2 seem to be aimed at addressing that; they do seem to want to balance PvP and PvE separately, which is something I want to support. Still some nerfs and buffs are going to affect both parties; I don't see how they can avoid this. The bulk of Division players are PvE focued, but the PvP crowd is no less important. The game has advertised PvPvE from its conception. They are only here for they were told would be here. They paid for the game too, and have a right to that content. I have never felt PvPvE would ever create anything other than a rabidly 'hate towards one another' player base, but that is besides the point. It's here and it's not leaving, so in my opinion we should just get down to how it is going to work best so both parties at least live with it. They tried that to a small degree in D1 and got railed for it. They've already stated that wouldn't happen in this game. They are already getting heat for offering 515 gear in the DZ and no where else, but they prefaced this in the SotG that this is a starting place, not the only place. They will add content if players like the idea. On a side note, I played the DZ in the PTS and it took me about 20 mins to have a bag of 10 contaminated items and about half that in clean items. I extracted with no problem and had about 4 GS501 pieces since I had a GS of 499. I will test if my GS509 build gets anything higher. In D1 we had to wait for the second year of content to get a PTS. We are 6 weeks in now and have one already. There is always balancing in the early stages (and after big content drops) of any game, but Massive is trying to get ahead of it this time so we can have a "good" game sooner. I hear what you are saying, but I think its too early to give up. If anything, take a break and maybe try back if things sound like they've gotten better? DZ is only the first place they are starting for the GS515 creep. If I had to guess, I'd say Raid, Heroic, maybe even Challenging to limited degree... will get it too. You know if they don't the Community will hound them until they do. Also, agreed on the Recalibrating. It could use a buff of its own. I played the PTS for a few hours with the Build below; not remotely optimized or does it have all the Talents I'd like. It does however include "Patience", which got a huge nerf. I solo'd 2 Invaded Missions, one on Hard, the other Challenge and then spent some time in the Open World, and lastly DZ. I haven't gotten to Bounties yet. Unstoppable Force did not get nerfed, nor did the Chatterbox, so this Build still felt strong. In fact with the "aggressive AI in higher difficulties" bug fixed, and the changes to enemy armor and damage, I actually felt like it had gotten a buff. I blew through Hard like it was a Story mission. Challenge slowed me down a little bit, but mostly just because you have have a Sniper, Explosive Drones and a Robot / Airburst Grenedier spamming you all at the same time. Damage-wise I felt like they were going down faster, but it may have just been preconception. Either way, it was extremely limited testing, but for the things I tend to be doing in-game, the changes so far have not really effected my experience. Still REALLY early though, and there were hardly any other players in the PTS yet, so we'll see how things look by the weekend. Frraksurred I'm running something similar for S&G @495 with dual-lmgs and a sawed-off (filler'-up, unstoppable, patience, 250k+ armor) and it feels way too cheese, but it's hard to get away from because of what it allows; outside of challenging, I don't think I even duck into cover to heal and can't remember using any active healing recently. I have to say it's stupid fun, but it's not very balanced; then again, it doesn't really work in pvp outside of special cases either, but there are other builds that dominate that (vectors and clutch, crusader/deflector shield). What it comes down to is that some talent builds synergize way too well with certain weapons and create cookie-cutter blueprints. As stupid fun as they are, they could use some kind of nerf on the pve side, but the immediate problem is on the pvp side (even being half strength). Glad to hear about the fixes on higher difficulties though. Being rushed by bullet sponges isn't that fun, even with a full squad, lol. Here is my WT5 Build from the full game for comparison. Same gear and equipment, but Recalibrated to higher specs & slightly different mods. This build does not feel as strong as the one from the PTS. jmaker, SereLaw and Q-BZ like this. How fixated should I be on staying with "green gear" vs something else? I'm pretty happy at present but of course with multiple loadouts I need to spend more time getting into some of this. I thought they said exotics get a buff across the board? Your stuff should feel stronger, I think alot of the changes were to the DZ more than PvE. I stick with the branded high ends because they set bonuses are better IMO. I run demo so I look at alot of explosive damage (china branded) and damage to elites. The gear sets aren't as good to how i play i guess. I think in State of the Game yesterday they weren't trying to make them better they were trying to get people to change their play style based on the gear they have. Q-BZ, jmaker, Frraksurred and 1 other person like this. That will cause people to change their gear. Who want's to use a talent that's no longer effective? I run unstoppable, on the ropes, patience, and compensated. I will likely rebuild my character. I only use the Chatterbox for its holstered talent, so its damage rarely plays into my game play. That said, yes the Exotics will get a blanket buff if successful during the PTS. SomeoneElse and Q-BZ like this. Had a ridiculously good run in ODZ Last weekend with a match made group. Didn't encounter any other players and the landmarks reset every 10 seconds! Reached the 30 item extract mail limit in about 30 minutes. I'm guessing this is unusual? Guy I was with rolled a 318k but I can't complain. This thing is nuts and i love it! Frraksurred, Q-BZ and Porter_ like this. Yeah it looks like it will be a fun weapon. I got the Adrestia SR1 from Tidal Basin but never bothered to look up how to get the rest of the pieces. I guess I’ll start now and work my way through the Invaded strongholds as they rotate back around. 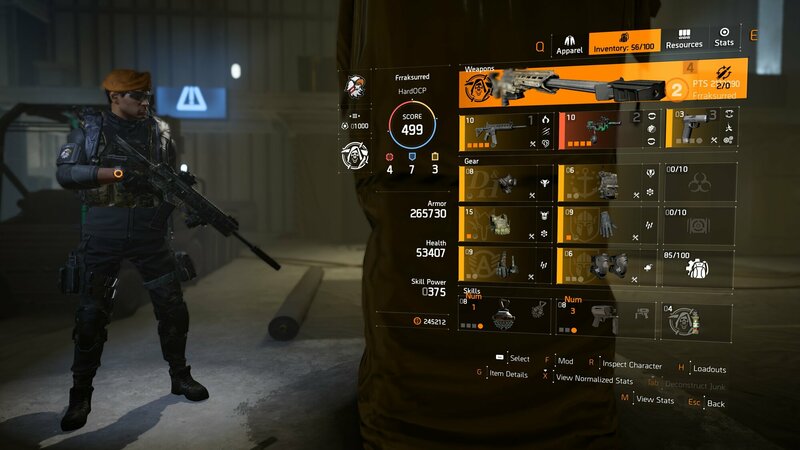 Is the Dark Zone the only way to get those exotic weapons? Nope. Nemesis, Chatterbox, Liberty and Merciless (all I've really looked into) can be had by piecing together their parts through the required missions. Each one I just googled how to get it and followed the steps as there doesn't appear to be any really helpful clues in game. Specifically, I used the guides attached to this article for each one. Crafted my 490, now I have to figure out where I'm going to get some Exotic Material. Might be time to try and farm the Occupied DZ again, before they make it crazy. Porter_, Q-BZ and jmaker like this.